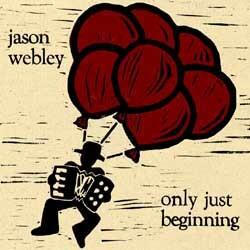 2004 - 10 song CD/LPRecorded in a haunted water-front hotel and mixed in a tiny floating river shack, 'Only Just Beginning' is Jason's strongest work yet. Recorded and mixed by the water. With: Michael McQuilken, Jherek Bischoff, Seth Warren, Sprout, Taryn Webber, Brant Campbell, Fred Hawkinson and Gary Luke.